Product #60832 | SKU D71 | 0.0 (no ratings yet) Thanks for your rating! The D71 is extremely thin and lightweight. Featuring 7" (17.78cm) 3RU Rack Monitors with dual 7” IPS 1080x800 screens. The FeelWorld Dual 7" 3RU IPS 1280x800 Broadcast LCD Rack Mount Monitor is extremely thin and lightweight. 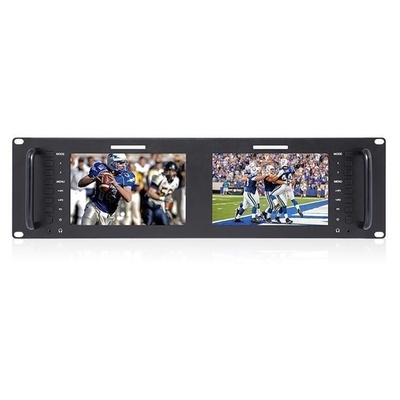 It features 7" 3RU Rack Monitors with dual 7” (17.78cm) IPS 1080x800 screens, viewing SD, HD and 3G-SDI video on 3RU rack monitor. With GPIO for Software control via Ethernet connection. The D71 uses an IPS panel, which provides a wide 178°/178° viewing angle and brightness output of up to 400nit. This means you’ll be able to see accurate, consistent and bright images from any point of view. It features a consistent design style, the same function and operation mode setting is one of the features of the products.